Spent some time fabing a housing for an older 12V air pump that I removed from it's case. The idea was to make it more compact for carry on the bike. Got it done, realized that I hadn't tested the hose. Clamped it on, and surprise, it leaks. 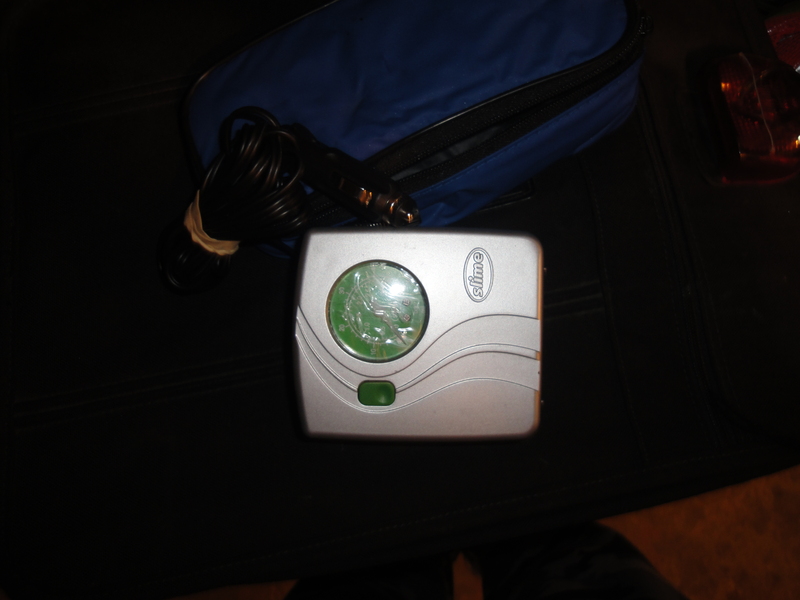 Have a smaller 12V air pump that I have been carrying in my truck. Removed the pump from the housing. Much more compact. So now I get to make another housing. Do you get a lot of flats where you live? I know there are Co2 canisters that are sold, which are small and fill the a tire quite fast. So far I have not had a flat. Currently I'm carrying CO2 and puncture repair kit. The pump setup will be for a trip I'm planning for next summer. Trying to cover my bases when very far from home. Step off Crux. Xeris just has a bad case of OCMD. He's even making up stories about "trips" to justify his compulsion. Fyi, it takes more co2 cartridges than you can carry on a bike to fill the tire. I used to do it that way. Don't forget the plug kit and razor knife too. Backoff VTR, I hate when someone gets inside my head. I figure with some planning I can pack 50 or so all over the bike. If I remove the coolant overflow I could put a case between the cylinders. Would that do it? It's OK if they get really hot. right? The hotter they are, the fewer it takes. It is still lighter, smaller and faster to inflate than your compressor. One thing I have found with small air compressors, like you have pictured, is they sometimes cannot even provide 30psi. And if they get anywhere near that, it takes an hour or more, draining your battery in the process. 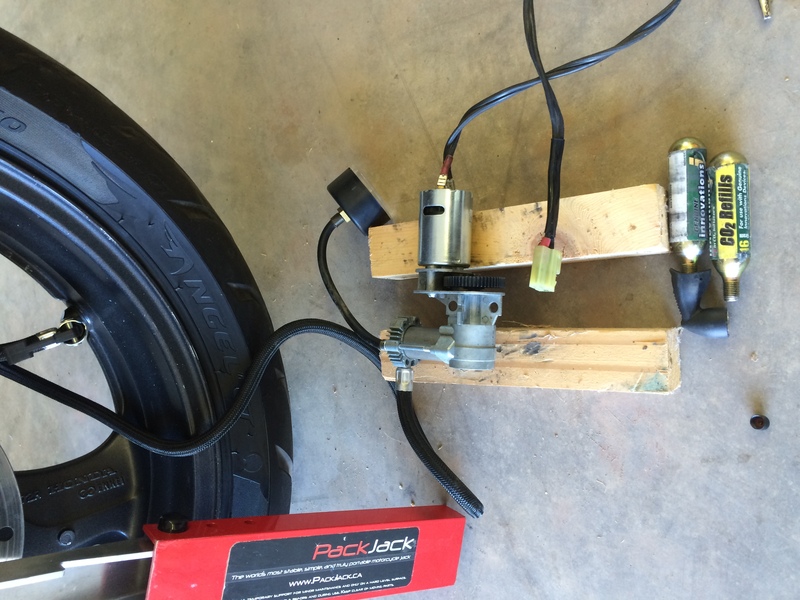 If you believe your compressor will work for this application, release the pressure from one of your tires and try to fill it before your trip. You might be suprised. Good advice. My plan for today was to test both the air pump and the CO2 setup that I have. 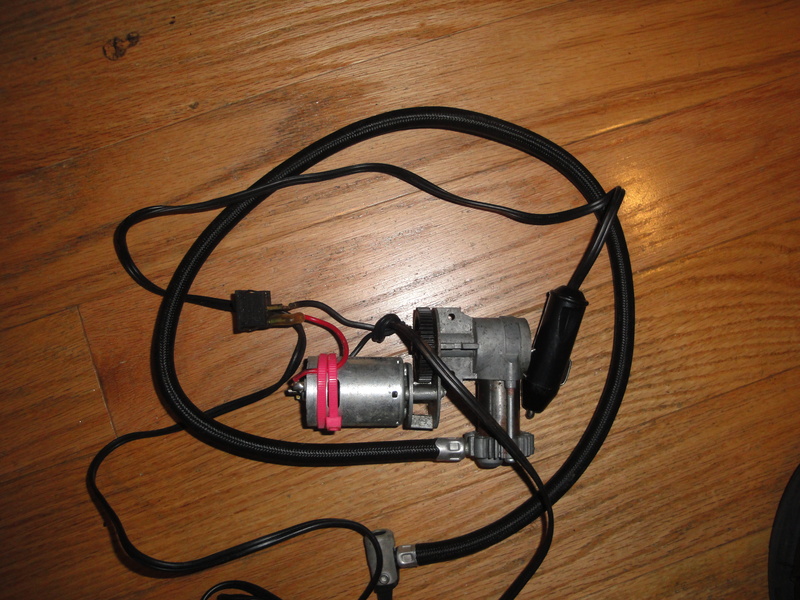 I have one that is the innards of a regular compressor, but sadly I cant find it in my garage. Had a flat last week so keep this little slime compressor with me daily. Fits under the seat. Plugs into the outlet on my dash or in my topcase. Oh and yes crux I was thinking of the small co2. I've been stranded by flats more than 12 times and had the dynaplug with me. It simply didn't do the job due to how tiny the plug is and that for a real hole you need several next to each other. In many different weather conditions it simply will not seal the tire. (the next plug pushes the previous out). I am going to look for the bigger co2. Any recommendations? The compressor has worked on many varied strandings. Last edited by smokinjoe73; 11-11-2016 at 06:36 AM. Tiny that thing is (see what I did there). The smaller pump I disassembled was a slime, but not that one. Without the plastic housing it is similar in size. Also have swapped the power cord with one I made that connects to my charging plug. I will post the results of the test. You have me concerned the the CO2 cartridges, even multiples, will fill the tire enough. I bought 2 dozen 16g co2 cartridges and 2 inflation housings when I first thought they could save me. Imagine the fun of being roadside at 4am on the Manhattan bridge watching the co2 empty and the tire still 90% flat. That's why I started carrying the compressor. Its not super fast, but it works. I would let the bike idle while using it though. You don't want to kill your battery. OK found the bare bones one I made years ago from a good quality compressor. This one saved me a few times in the middle of nowhere. CO2 is temp sensitive, so perhaps they will not work in very cold environments, not sure only tested down to 60 deg. And if you had a tire with a lot more volume than the VTR stock sized rear it may not be worth it. I like that this one threads on the the valve stem. Wet, cold, dark, tired, on the side of a busy road, I need no help in making errors. Thanks for your input. The results I achieved were about half what you had. Had a couple of 16 gram cartridges that I tested. First one I accidentally vented some gas. Starting from 0 psi in the tire, only gave 2 psi. The second starting from zero again, gave 4psi. Looks to be the same one That I stripped of it's housing. 3 1/2 min and 22psi. Did not check battery voltage before, but after it was 12.85V. In a real situation I would have had the motor running. Yes Erik the other issue I face is that I ride in cold weather a lot so co2 is muted. That little tiny pump got your front tire to 22psi? That is enough to at least get you to a gas station to fill it the rest of the way. Impressive little pump. Smaller compressors have tiny pistons and there for can usually go to like 200psi. Each pump is small but therefore a huge mechanical advantage. Like first gear on a bike.